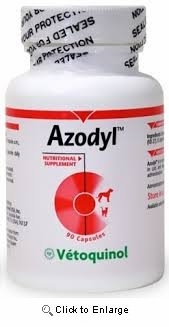 Azodyl® Caps is a nutritional supplement designed to help dogs and cats with renal failure. It slows down uremic toxin buildup, which helps prevent further kidney damage. The patented formulation of naturally-occurring beneficial bacteria flushes out the uremic toxins that have diffused in the bowel, reducing damage and failure. 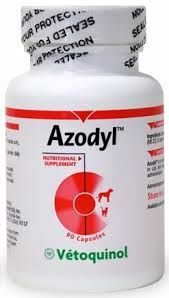 Azodyl helps prevent further complications from kidney disease in dogs and cats. Animals weighing up to 5lbs. Give 1 capsules daily. Animals weighing 5-10lbs. Give 2 capsules daily. Animals weighing more than 10lbs. Give 3 capsules daily. 2 capsules am, 1 capsule pm. How much Azodyl will I receive? Each bottle contains 90 small capsules. Since this product needs refrigeration, it ships in cooler boxes with ice packs at no additional cost to you. Please note that the ice packs are not designed to arrive frozen. They are only used to keep the product cool during shipping. The product itself can be keep at room temperature for a few days without it being damaged. Also, this product can only be shipped via Next day or 2nd day as the ice packs will only last a few days. We now offer flat rate shipping for FedEx/UPS 2 day service. We only ship Monday through Wednesday to avoid weekend delays. Items cannot be shipped to a PO box. *In the Continental USA only. Starts at $9.95 for States close to our warehouse in Florida. For AK, AZ, CO, HI, MN, OR, PA or WA, add an additional $6.95 to freight cost.